Definitely worth checking this one out. This is the ‘spiritual successor’ to Baccano! but much less violent, yet no less twisted. Show time is 12:30AM EDT. Shows are usually available streaming on http://www.adultswim.com/ following broadcast. “Mikado Ryūgamine is a young man who longs for the exciting life of the big city. At the invitation of his childhood friend Kida Masaomi, he transfers to a school in Ikebukuro, Tokyo. “Masaomi warns him about people he doesn't want to cross in the city: a violent man dressed like a bartender, an information merchant, and a mysterious gang called "Dollars." 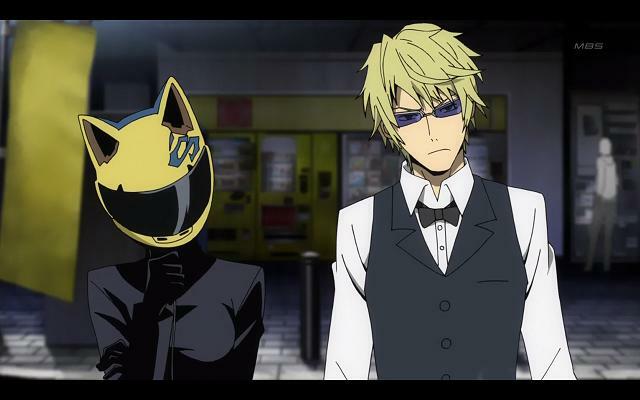 And to top it off, Mikado witnesses an urban legend on his first day in the city: the "Black Rider," the supposedly headless rider of a black motorcycle.